To review the previous tutorial in this series, click here. To to back to the start of this series, click here. Welcome to the third tutorial in our “Getting Started” series. In this tutorial, you will learn all about Client Profiles. The Client Section provides you with easy to use tools that are designed to assist with the day-to-day management of client information. Once entered, the program will use this information to streamline client administration by automatically populating the relevant information to client related pages throughout the management system. - Here you can maintain comprehensive client profiles including a client number, contact information, date of birth, occupation, gender, etc. - The tools in this section allow you to easily create printable client invoices and post them to their account where you can track the client's account payment history. Once you have a client selected, this area automatically loads a new, blank invoice. - In this section you can document and monitor client treatment activity and progress. From here you can check or update the client’s general medical history, enter your S.O.A.P. Notes or find and print SOAP notes from a previous session. Once you have created your first client, the page automatically loads to that client. You may switch clients at anytime by clicking on the Find Client button . Use the view icon to select the client and you will be taken to their record. Unless you choose to switch clients, your system will keep you on the same client record as you switch from profile to accounts or records. 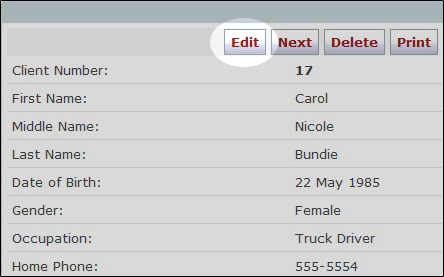 Edit Clients: Once into an existing profile, simply click the edit button change their information. Remember to visit our Support Center at www.mindzplaysupport.com if you need assistance.